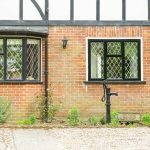 What's the Best Wood to Use for Timber Windows? There is no doubt that timber window frames are beautiful and ideal for an authentic and traditional look on any home, particularly older and period buildings. Made well and maintained with care, timber window frames can provide a beautiful aesthetic, whilst lasting for many years – making them an investment well worth considering. Making the decision to install timber window frames in your home is unlikely to be difficult – but choosing which species of wood to use is likely to be a little tougher, seeing as there is such a wide choice of different woods to use. 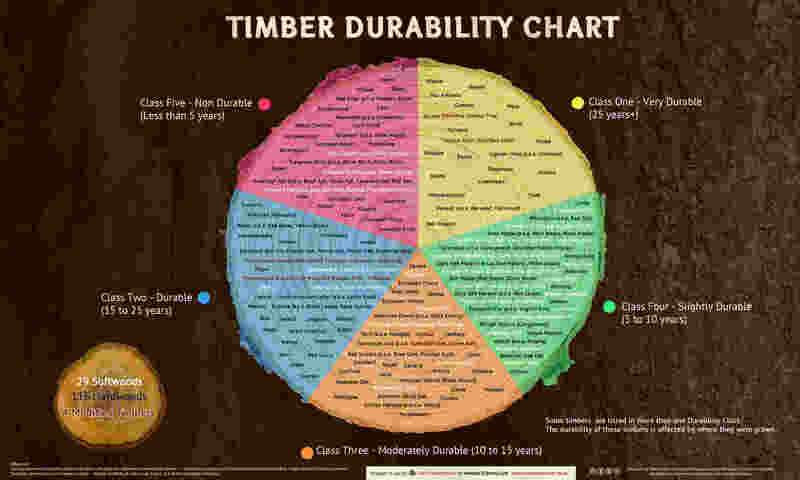 Below is an excellent chart from ‘Gate Expectations by Inwood’ showing timber durability, although a variety of timbers from across this list are appropriate for use in the construction of windows and window casements. We’ll discuss the main types of timber and why you will want to opt for them below, but the highlighted red and white suggest some good options for windows. Click to enlarge the image and view wood types more clearly. The first way to narrow down your choice of wood to use for your window frames is to choose between the two main categories of woods. Hardwoods and softwoods have different properties to meet the different requirements. Hardwood tends to denser heavier and harder (although not always – despite its name! ), varying in dark shades with intricate grain patterns. Hardness in terms of wood is how resistant it is to impact damage. Softwood is often less expensive but lighter – both in weight and colour – and less dense. Most softwoods are more sustainable than hardwoods and tend to be very good insulators. 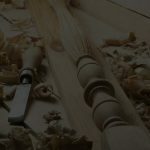 Softwoods are easier to laminate, which is the bending of wood to make curves going in the direction of the grain, not to be mistaken for warping which is the natural bending of wood. Oak is a British grown and loved hardwood, consistently used for hundreds of years in building construction – not just window frames. Known for its incredible strength and durability, using oak as your timber of choice for window frames will result in incredibly long-lasting beautiful windows. Oak is not cheap and, as with all hardwood, is more difficult to work than softwood. The results, however, will nearly always outweigh these slight negative points. Hardwoods, in general, tend to be more expensive because they have a better aesthetic appeal. West African sourced Sapele is another popular choice and particularly well-suited to joinery. This tropical hardwood is reddish-brown in colour, with stunning grain patterns that can easily be brought out with a transparent coating. Sapele is moderately durable, and window frames that have been made of Sapele can be expected to last in excess of ten years. There are other popular hardwoods, such as Idigbo, which is also sourced from Africa and often used as a less expensive alternative to oak. As with any wood sourced outside Europe, you might want to seek reassurance that your wood is sourced from a sustainably managed forest, should that be a major concern for you to factor into your decision-making process. Redwood is a very popular softwood to use for window frames – perfect for those who wish to maintain a traditional look with a modern finish. 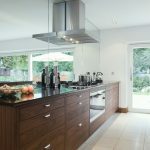 Cheaper than hardwoods, it is easily sourced from sustainable forests within Europe and grows incredibly straight with a beautiful grain pattern. Naturally water-resistant, the beautifully coloured redwood is durable and longer lasting than many other softwoods. Accoya© is an increasingly popular sustainable wood to use for window frames, that looks beautiful but generally needs less maintenance than oak and other hardwoods. That’s because Accoya© is a modified wood product that is treated with a non-toxic formula that changes the cellular structure of the wood making it significantly more stable, water-resistant and insulating than many other kinds of wood. What’s particularly attractive about the use of Accoya© is that because of its performance enhancing properties, it can last for well over 60 years – making it a very attractive rival for oak. Read more about the Accoya© brand on their website here, or check out our Accoya© wood page for more detailed information on the product. There are plenty of other woods you can use for your window frames, but the ones we’ve mentioned tend to be the most popular. Other softwoods often used for windows include larch, cedar and fir. Cheaper than hardwoods, most softwoods are conscientiously sourced from around Europe. If you’d like to know about the most suitable type of wood to use for your new timber windows, why not get in contact with us to discuss your requirements further? Or you can ask us over on Twitter!